The mind is a collection. It has ideas; it stores memories, and recalls them. It processes information-- taking impressions in through the senses, and working on internal models. This is so basic that it has become intuitive; it is hard to speak of the mind, let alone think of it, without falling back on this set of habits. But what appears intuitive was the achievement of an age. Models like these had to be brought into being. And they were brought into being by a relatively small handful of people, the same people who were capable of owning things: people like John Locke, Joseph Addison, Alexander Pope, Joshua Reynolds. These are people who were relatively privileged, never seriously in debt nor in trouble with the law, generally well-off and fortunate in their patrons and prospects. In some ways, it would be a wonder if people like this thought of themselves as anything other than the possessors of ideas, since they built lives as the possessors of so many other things: like property, rights, careers, and so on. Well, what about everybody else? I mean people whose experiences of loss far outweighed their sense of stable possession. This includes the poor; it includes most women; it includes people with unsettled or mobile jobs; it includes those in trouble with the law. In short, it includes the vast majority of people in seventeenth- and eighteenth-century England. Where do we start looking for their stories, or the spaces in which they modeled their minds? And what kinds of models, marked by dispossession, did they build? It goes without saying that this is a difficult project, much more difficult than tracing the mental models built in a space like John Woodward's cabinet (exhibits 6-7). If we want to revisit the ecology of Woodward's mind, we can simply go there. We can travel to the Sedgwick Museum of Earth Sciences, where it is. But what about people forged in the shifting fortunes of literary hack-work? What about someone who never had a stable address, let alone a collection of stable things? And what about someone like Jonathan Wild who lived a deliberately double life, who, in fact, built a life out of other people's property? Where do we look for them? This space, which is perhaps the most important space in the museum, is an attempt at this project. It contains low genres, low art, and scenes from low life. It tends to focus on what Alexander Pope dismissively called "Lower Parnassus," the site of literary and cultural recycling, the lower reaches of London culture. And it begins the task of undoing the dominant metaphor of mind, of the mind as a collection. In this sense, these handful of exhibits have a heavy task; all they have to do is reverse the work of the rest of the objects in the museum. They have to show us dispossessed individualism, the cognitive burden and transformative potential of dispossession. An uncirculated 1701 Shilling, minted in the year of John Phillips's short poem, entitled "A Burlesque of Milton"; it was a first of its kind, a poem about owning not a shilling in the world. Photo courtesy Royal Mint Museum. A page from Alexander Brodie's New and Easy Method of Book-Keeping (1722), 8, engraved by George Bickham the Elder. Bickham and his mercurial son specialized in trompe-l'oeil, eye-catching realism, and engravings meant to simulate handwriting. A sheet of blank paper, sacrificed by Laetitia Pilkington into a poem about dispossession, and included as part of her scandal-memoir. Pilkington, Memoirs of Mrs. Laetitia Pilkington, 3 vols. (London, 1735), 1.109. 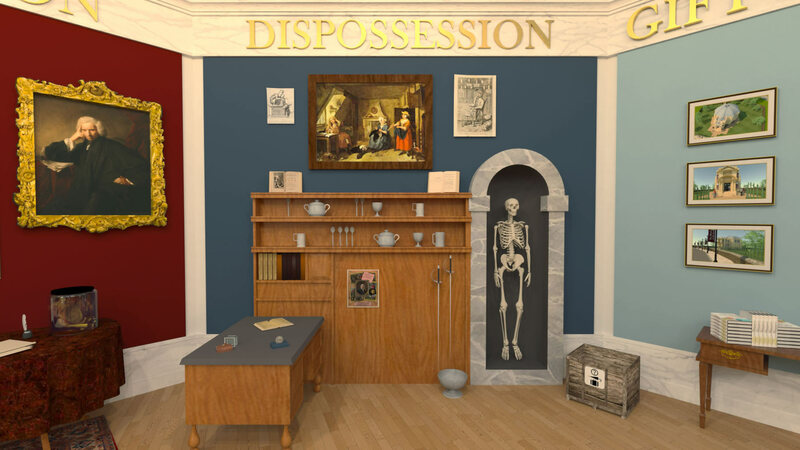 An artist's fantasy of the interior of the Lost Property Office, a clearing-house for "drop'd," "forgot," "misplaced," or otherwise "lost" property. “Honest Jonathan in His Repository,” in Life and Glorious Actions . . . of Jonathan Wilde (London, 1725). Courtesy Huntington Library, San Marino, California. William Hogarth, The Distrest Poet (1736). Hogarth's poet, dwelling in poverty, is writing about riches; he is borrowing scraps and ideas from other people's work. Photo by Author. Original at the Birmingham Museum and Art Gallery. John Gay, by George Bickham the Elder. This so-called "medley print" is a still life of low art composed from pirated bits of poetry and sold by the George Bickhams, father and son. Image Courtesy National Portrait Gallery, NPG d9490. An articulated male skeleton, age forty, believed to be of Jonathan Wild. RCSHM/Osteo. 336. Courtesy Hunterian Museum at the Royal College of Surgeons, England.